Travel Joy Crossland is a December 2017 release luggage set of three pieces with a modern design. These are hardshell suitcases made of solid ABS plastic and include the side mounted TSA-compatible locks. The Crossland is a popular travel product at Amazon.com that scores 4.3 out of 5 stars by 17 customers on the day of this review. You have a 20” cabin bag, a medium size 24” suitcase and a large 28” suitcase for your long trips or when you have a lot to take with you on your journey. This three-piece solid luggage set is offered with two free gifts, a shoe bag and a backpack. 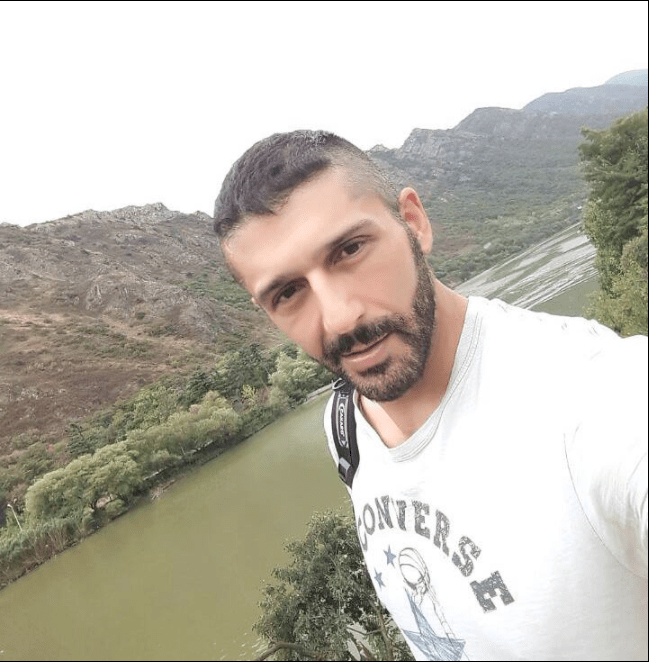 Please also have a look through the many questions answered by people that purchased and used the product for months and by the Travel Joy representatives. You have six color options to choose from: Black, pink, green, silver, Burgundy and blue, all with the same price tag except for the black about ten dollars cheaper at the time of this product review. Like with any suitcase set that you purchase online you’ll get these three bags and two gifts fitted into each other, which is also an ideal way to store. But the contents of the packaging is visible from the outside. And if you have a problem with that and need some privacy, please select the “Conceal Package” option before you check out on Amazon.com. 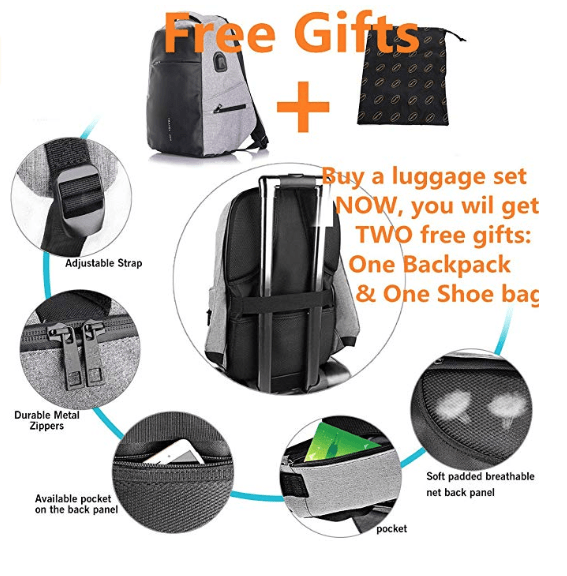 The two free gifts of a shoes organizer bag and the fashion backpack are both good quality. The backpack has an adjustable pocket at the rear, an internal pocket, a nicely padded breathable net rear section, solid good quality metal zippers and the adjustable straps. The ABS material used on these bags make them both lightweight and sturdy and resistant to impact. All three suitcases come with the 360 degree quiet spinner wheels that move in multiple directions, offering you a high ride comfort. The robust material used on the wheels will make them both safe and durable. By holding the solid and ergonomic telescoping handles you’ll get to maneuver in very tight areas and you’ll be moving the bags almost effortlessly. The solid plastic zippers with metal heads and pullers on each bag include lock holes as you see in the photo. And the TSA locks will let only the authorized TSA staff at the airport terminals to open your bags without needing to break the locks, and will help prevent theft. You can use the backpack when you’re going to gym or heading out for a walk to carry your water, wallet, phone and other small belongings. The sturdy ABS suitcases are good for trips of different purposes and durations. The 20” cabin bag weighs 6.2 pound, has a 42-liter capacity and measures 20 x 15 x 9 inches. It is suitable for use on 1 to 3 days of travel and as a carry-on luggage on most overseas and domestic airlines. The 24” medium size suitcase weighs 7.7 pounds, has a 74-liter capacity and has the dimensions of 24 x 18 x 10.5 inches and is suitable for 4 to 6 days. And the largest 28” suitcase: 9.9 lb. weight, 110 liter capacity and 28 x 20.5 x 12.5 inches and for a week or more. The Travel Joy Crossland suitcases look glossy, are scratch and impact-resistant and more durable thanks to the exterior metallic finish. And you’ll find the nylon lining inside with a large zipped garment divider for better organization, two accessory pockets, a small mesh pocket and two cross straps. They offer good amount of storage space but none of them is expandable. The fashion backpack is a standard sized bag of decent quality and does not include the wheels. Warranty offered is two years by the manufacturer if and when you experience any problems. 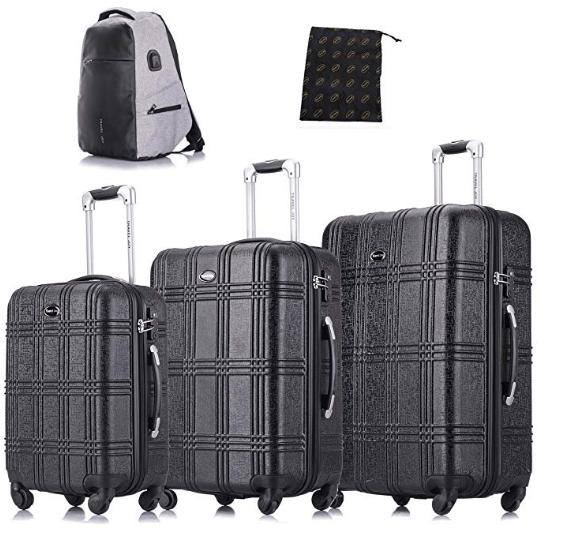 The luggage set offers great value for money, especially with the fashion backpack and a shoe bag.